This is a video I believe every Asian American–heck, every American–should see. 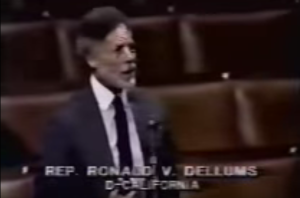 In it, the Honorable Ron Dellums from Oakland gave one of the most stirring speeches about the effects of the taking of Japanese Americans had on people outside of the Japanese American community. No matter how times I watch it, I tear up when I hear him describing his crying out when his best friend was taken away. During this time of fear, hatred, and violence toward the Muslim, Arab, and Sikh American communities, it is important that we keep the unconstitutional incarceration of more than 120,000 Japanese Americans during World War II–including my family–in the forefront of our minds and not let it happen to anyone in our country ever again.